Use a mouse to move a menu as a usual window. Also you can create the menu where each submenu can be "separated" from the menu (MS Office toolbar-like mode). When the page is scrolled the menu remains visible. The menu can "float" along one or two coordinate axes. 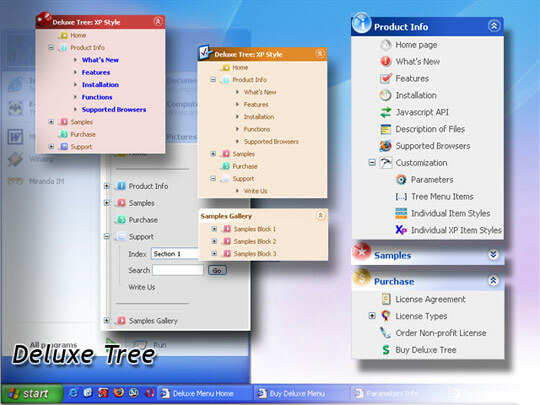 There can be multilevel menus - create as many rows of the menu as necessary. Any submenu in its turn can include different number of columns. Q: it's possible to use on every Item the OnMouseOver / OnMouseOut event? move the mouse over a Menu !!!!!! 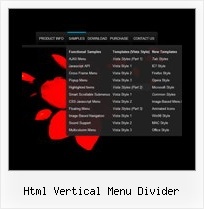 A: Each menu items can include any html code. DIV's to show when you click on the tab. You should paste your content in the <div> .. </div> tags. You can assign only links in this mode. You should create top level items with subitems. "link:" - means that there is a link after it. Q: I would like to know how to define separator on itemstyle or how to show separator on menu items. Checking the html output revealed that the submenu entries didn't ... Tried Dylans mod but that just gave me back a vertical menu again!